MotherhoodLater.com - World’s leading newsletter, website and community for midlife moms: ROBIN'S SHOW RECOMMENDATION: Curious George Live! CURIOUS GEORGE®, the irrepressible little monkey who has captured children’s hearts for generations, jumped into action when he takes the stage in the inaugural tour of Curious George Live! 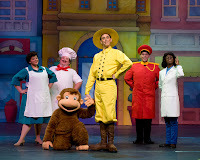 Starring in his own original live musical stage production for the first time ever, Curious George is on a mission to help Chef Pisghetti save his restaurant by winning a world-famous meatball competition. With guidance from his friend, The Man with the Yellow Hat, George’s adventures take him to Rome and The Golden Meatball Contest. With every swing and flip, George takes the audience through a fun-filled, entertaining story filled with music, dance and follow-that-monkey fun. Children and parents around the world have delighted in Curious George’s adventures in books for nearly 65 years. Created in 1941 by Margret and H.A. Rey, Curious George has provided the inspiration for books, movies and a television series, and will continue to educate and entertain children in Curious George Live! by introducing them to a limitless world of exploration and discovery while offering wholesome family fun. Featuring original composition and familiar songs and professional singers and dancers, Curious George Live! will entertain young audiences. For information, visit Curious George Live!. To order tickets and receive a discount, use the passcode FRIEND online in “promotions and special offers” box on Ticketmaster.com, or at the box office. Visit ticketmaster to see if the show is coming to your town.